Ta-Dah!! (Or as my daughter says, "Ta-Tah!!" She has no idea why I find this funny.) 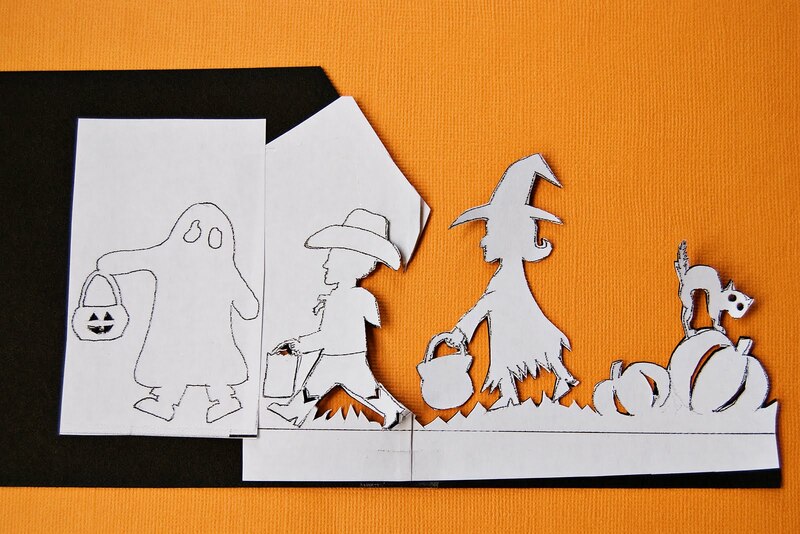 This is my own drawing/template, yours to print off and use to make your own Halloween scissor-cutting. Right-click on the template. Click on "Open Link in New Tab". You should be able to print from that image. 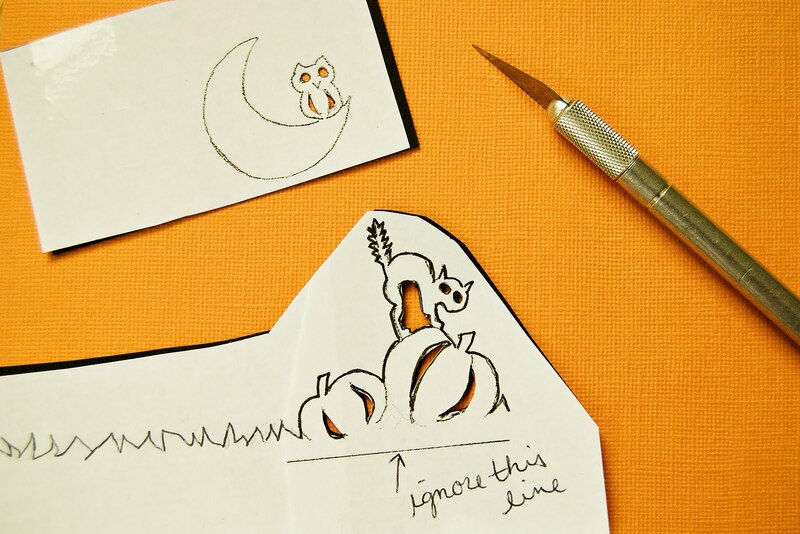 Once printed, use as much or as little of the template as you like. 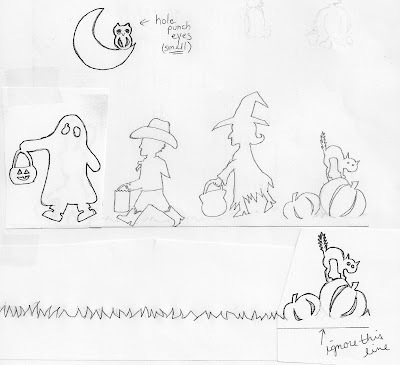 You may only want to do the moon and the owl or the cat and pumpkins - enlarge if you'd like. 1. Cut the excess white paper away and tape to a piece of black paper. (Unless you want to make a white silhouette. 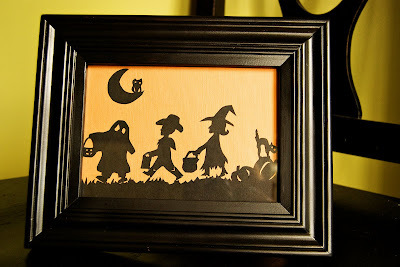 Which I think gives this wonderful craft a modern look to it - however, I like the black for Halloween.) I'm not sure if this taping process is "cheating" in the scissor-cutting world, but I certainly didn't want to cut out the pattern, trace it with a white pen on black paper and then cut it again from the black paper. If you want to do that - knock yourself out. Seriously. 2. 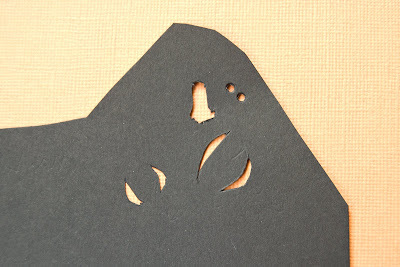 Use your exacto knife and tiny hole punch to cut out the small inner pieces and eyes FIRST. 3. 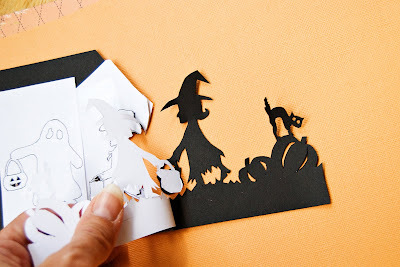 Using fine tipped, sharp scissors, cut around the outer lines. 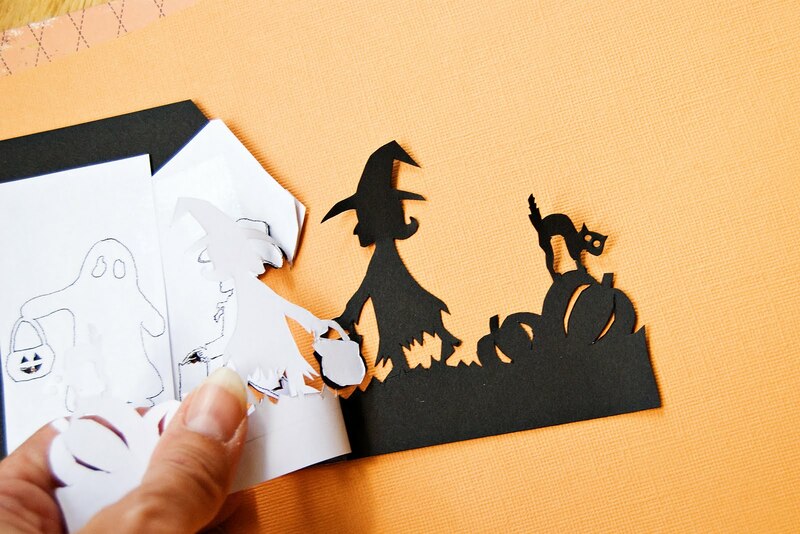 Turn the paper, rather than your scissors to get a better cut. 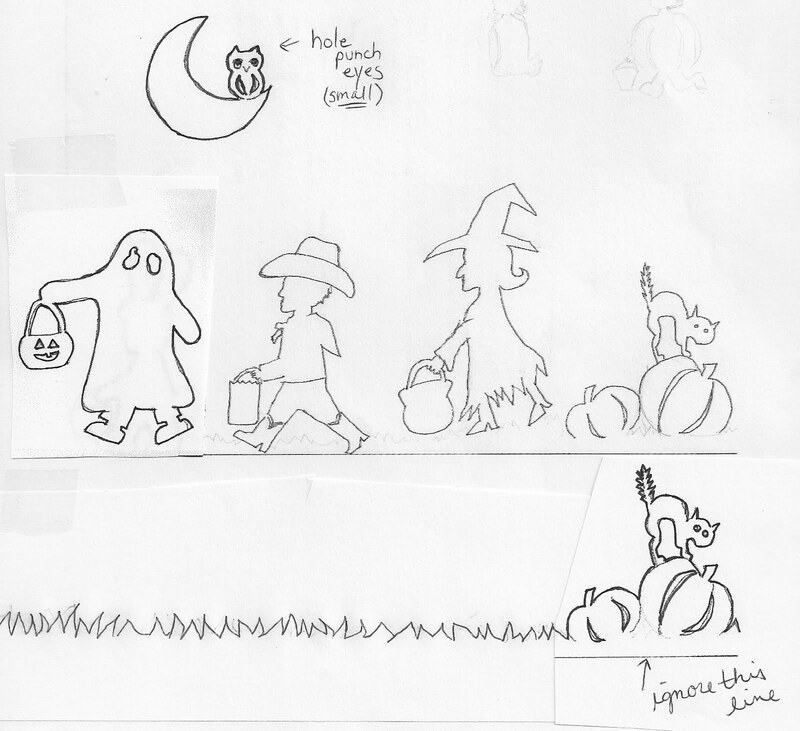 Sorry I didn't have the grass drawn on my original drawing, but I kind of pieced this together as I went. If your cuts are not perfect, don't sweat it! Perfectionists are chicken-$hits. If you are a perfectionist, I'm sorry, someone had to tell you. 4. Find an old black frame, use one ya have or get one on sale...this pattern fits just right in a 5x7 frame. 5. 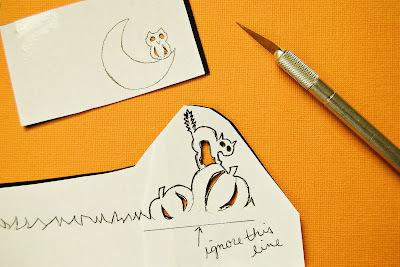 Pick out a sheet of colored or patterned paper and glue your cuttings down. You might get inspired and draw your own little figures to match your little one's costumes. 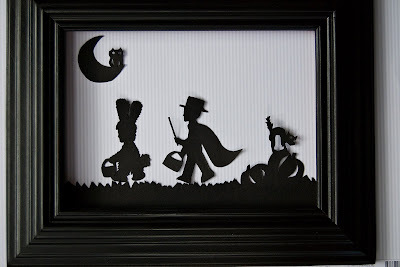 I made this magician and bunny rabbit for my friend who's boys are dressing in these costumes. I thought she was so creative making their costumes relate like that! Way to go, Amanda Carol! Too too cute! Love it! You did a really good job! Pat your self on the back and have a cookie! I love to cut out small detailed things, but I do it for collages. Thank you for sharing your talent! oh - sooo adorable!! love these. i might give these a whirl. makes me wonder if i could do a princess gown for my nieces. and the simplicity to make..